More than four years, three countries, four agencies, one devastating loss of a foster son we had hoped to adopt and too many “near matches” to count after we had started the adoption process, I was moved to send our friends an “adoption update.” In short, it informed them that even through it all, we felt the Lord saying, “It’s not over yet.” Not even we could understand why, after all of the heartbreak this process had caused our family—our three biological children, my husband and I—we would still be willing to keep trying. Others offered encouragement by saying, “Maybe God was just testing your willingness, but you were never actually meant to adopt.” We couldn’t believe that our God would leave us there, a year after our foster son, “Ollie,” left, having healed so much, and yet still so broken. We sent the placing family our profile and waited on pins and needles. We had a phone call with them and waited on pins and needles. We found out, later when we went out to pick up our daughter, that the reason they felt so confident in us as a family was because of the heartbreak we had gone through only a year earlier. They knew that we had experienced, firsthand, how difficult adding a child from a tough start in life can be for a family and that gave them confidence that our rose-colored glasses were tossed in the trash a long time ago! This was a really tough adoption process, emotionally. 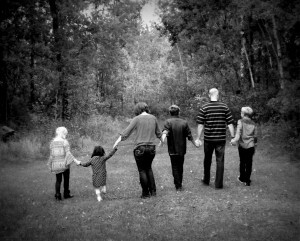 Our family had experienced loss very similar to the type of loss our daughter’s first family was experiencing. When we met our daughter for the first time, her family had told us to just be very casual and almost ignore her so that she could come to us on her terms. It was great advice, but heart-wrenching. Oh, how I wanted to scoop her up—this child I had waited for nearly five years for–and hold her closely and whisper, “Mommy’s here!” in her ear. And I think the thing I was least prepared for was the fact that when we met her, it was very clear that she was someone else’s child. She had been adopted already and that family had done everything they could to love her and bond with her. They had not been entirely unsuccessful and that was apparent. It was a strange dynamic to navigate—allowing her first family to be her family and to do the diaper changes, and kiss the owies, and set and enforce the rules and boundaries—knowing that in only two more days, she would be placed in the car with us and we would take over those responsibilities. We anticipated a really difficult 3-day trip home with lots of screaming, raging, etc. There was no crying. There were no tears. There were no rages. Our daughter seemed contemplative, yet comfortable. She hammed it up for the kids and they were happy to entertain her along the way. Though things went as well as they could have, it was an emotionally and physically exhausting trip and we were thrilled to get home! We have spent the last six months figuring out life with a toddler again. Attending specialist visits, scheduling surgeries, attending physical and occupational therapy and potty training have created opportunities to bond with our daughter and to see that she has bonded with us. When she doesn’t want to leave me to go with her therapist, her big sister goes with her. Her older siblings gather around her to do “morning stretches” with her before our oldest son puts on her leg brace for the day. After seven months together, our three older children still argue over whose turn it is to carry their sister downstairs in the morning. The girl we adopted is a completely different child than the one her first family adopted, and it’s not because we are doing anything better than they were—they are great people and our family loves them all so much—it’s just that God had big plans for a little girl…plans for her to touch the lives of not one family, but two. After all they’ve been through, our biological children needed to see that adoption can work. After all that she’s been through, our adopted daughter needed to see that adoption can work. She has bonded quickly and complete strangers have commented that they would never have guessed she has only been with us for 6 months because she just…fits. Of course, people are more than happy to remind us that “It’s really early” and “This could just be a honeymoon.” It’s true! Any parents know that things can change very quickly—with biological or adopted children—but for now, we’re choosing to just enjoy each sweet moment with the daughter we have searched the world for!